At its 96th session from 6th to 30th August 2018, the UN Committee on the Elimination of Racial Discrimination (CERD) will consider the situation of racial discrimination in following 7 countries. 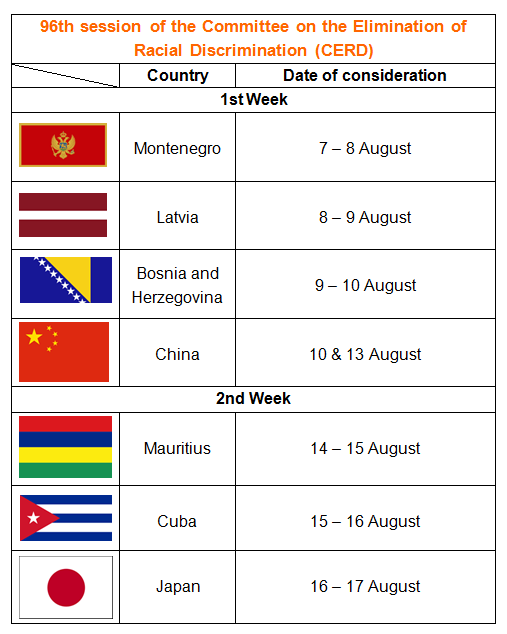 Civil society organisations (CSOs) are encouraged to submit information on Bosnia and Herzegovina, China, China (Hong Kong), China (Macau), Cuba, Japan, Latvia, Mauritius and Montenegro. For States parties’ reports, list of themes and other documents, please visit the 96th session page.